Today’s Intention ~ I am grateful. Meet Miss Liz. 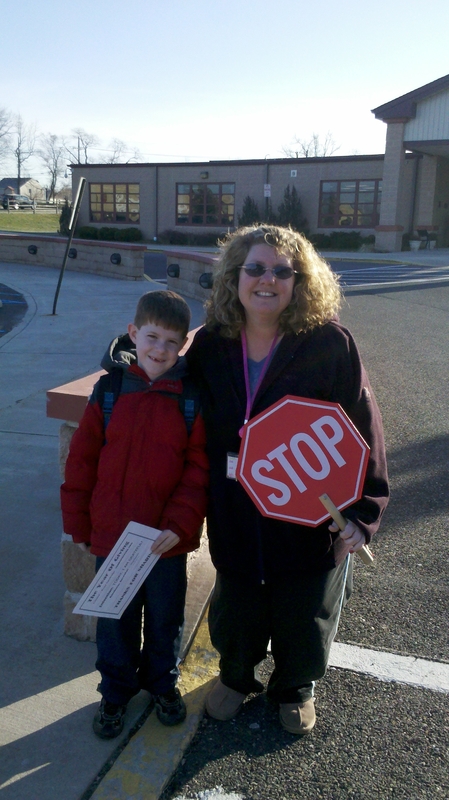 She is the hardworking friendly lunch aide and crossing guard at elementary school of my boyfriend’s son Gregory. This mother of three daughters is always concerned about the children’s safety and was surprised by my gesture. She showed her appreciation with a large smile. She will be giving the money to the humanitarian efforts to help Japan. She is so grateful for all that she has: food, clothing , shelter and feels it’s important to give back to people who have far less, especi ally the people of Japan. I’m glad that today I was able to get a child involved in helping me give to someone; especially someone who offers so much help and support to children. Today will be the last day that I will share my journey with you. I am so grateful for having the opportunity to get involved in the Year of Giving! It was a great joy to be part of it and I truly believe it inspires others as well. I know today Gregory will be thinking more and more about giving. A funny side note is that I keep finding money! I found $6 in an old coat, $20 in the washing machine, and my mom gave me a scratch-off lottery ticket that won $50! I met birthday girl Liz at Border’s Bookstore. She was working intently at her computer while listening to her iPod, the image of today’s college student. I approached her as she was packing up and she was at first surprised and unsure about the Year of Giving. She asked if I was going to ask her a bunch of “philosophical” questions about the meaning of life. Being a deep thinker, I thought if we had more time I probably would have. Instead I said I just wanted to learn a little bit more about her and her story. Liz began sharing that she took a year off after highschool before she started community college. She is currently undeclared, but she does harbor the idea of eventually going to law school. She told me she would also like to take philosophy classes in college. Liz went on to explain her passion for story telling. She told me about a fictional love story she wrote in a blog a year ago. She elaborated that she was contacted by a man who wants to turn the romance into a movie after Liz converts the blog into a script. I now wonder if that is what she was working on before I approached her with the $10. Liz also shared a ghost story with me about Ellicot City, Marlyand which I thought was funny because I have actually been there before. Later in the conversation, I found out that it was Liz’s birthday and she was meeting up with a friend soon, but before she left I asked her what 3 things bring her joy in her life. She said her Bichon Hagen, her family (Liz currently lives with her mom and her older brother just got married), and finally that one day she may be discovered! Hmmm, I wonder if that means joy that she will discover in herself or someone will discover her great talents as a writer. Liz was a friendly young woman who I enjoyed speaking with! I made an avatar of Liz because she didn’t want her picture taken. Her hair was more blond with longer bangs, but I wanted to do something fun to honor the birthday girl/college student/writer who loves her dog and family! Oh and she said the $10 will buy her coffee. She loves coffee and it keeps her going. We both shared a good laugh that I was able to give her a surprise birthday gift!